Seriously dear readers, would you wear this pair of shoes? I love me my shoes and I may have a bit of an addiction to funky footwear but I would not want a pair of these on my tootsies anytime. Yup, even if they are red, which is my absolute favourite color in the universe! This is for ballerina's who cannot quite master their pointe steps and need to cheat their way through ballet school perhaps? 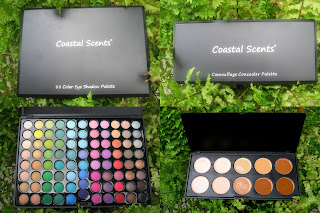 What a blast last week was - I received three packages; a bag for subscribing to a monthly magazine, a paper shredder that I got in exchange for some rewards points and finally, last Friday my month long wait for 2 items I purchased from Coastal Scents finally arrived! 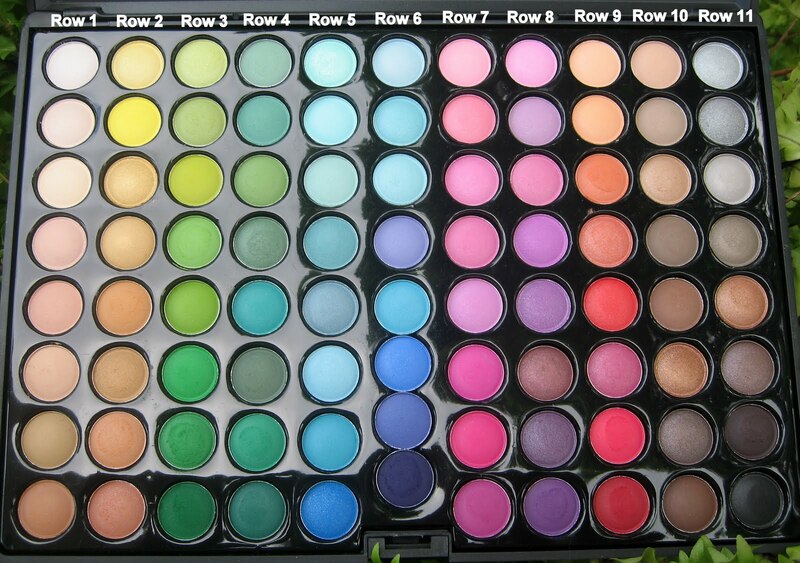 They are the 88 Color Eye Shadow Palette and he Comouflage Concealer Palette that you see below. I was most interested in the Concealer Palette as my current concealers were doing a blah job of covering dark rings around my eyes from bouts of insomnia. This time, I went for the industrial strength concealer to tackle the job! 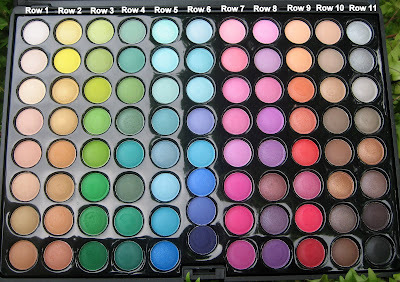 The 88 eye shadow palette was more to fulfil my curiosity of this beast of a palette- I mean, come on EIGHTY EIGHT?? This will last at least the next 3 generations and then some! Oh well.....you never know when the need for neon pink shadow will arise and if indeed it does, I shall be prepared for sure. Mum's already got her eyes (pun intended) on the earthy tones of the palette. And finally.....when both 'models' threw a diva fit claiming they were tired, I had to take over and swatch rows 9 to 11! 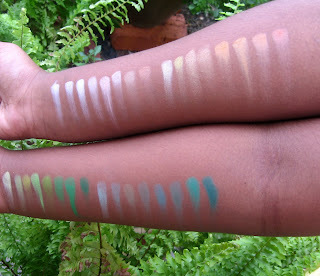 I take back what I said earlier....after taking a good look at the swatches, I can see myself wearing these colors. As they say in the industry, blend, blend, blend! As for the concealers, if you see the picture below, I played around with it and found that it concealed really well. I used a mix of colors and it looks a whole lot better than the unconcealed eye. I had not visited M.A.C in a long time and since I was within two feet of one recently I decided to pop in for a look see. 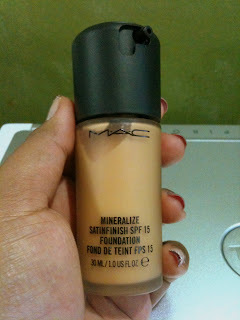 I came away with a bottle of their Mineralize Satinfinish SPF 15 Foundation in NC42. Not my usual color though - in the normal foundation range, I'm an NC45. The reason for this choice of color will be explained shortly. This foundation is lush, and light and has some light reflecting particles in it that make your skin look fresh. I got the SA to apply some on the back of my hand and when I looked at the swatch, it had a subtle glow to it which got me hooked. I am all for the glow sistah's! 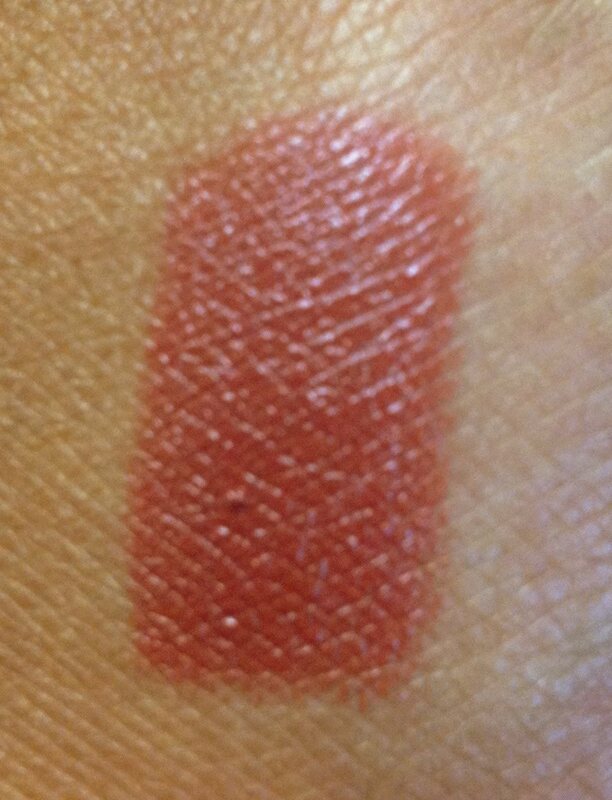 The SA offered to try NC42 on my face so I can see the overall effect however, I did not like what I saw and was overwhelmed by how the color was too light for me. I kept insisting that I was an NC45 and she agreed. She explained that this mineral foundation oxidizes on the face and after about half and hour the color would suit me better. The look I gave her suggested I was not totally buying into it and for the first time, I felt she cared more about my satisfaction than just making a sale.....yes beauties, she told me to continue shopping and come back in 45 minutes! I took her offer and went to drool over some Charles and Keith before I realized that my foundation had turned to a perfect shade of me! Love! I marched right back and bought it - the rest as they say is history! I am rockin' this right now because it just gives my face a brighness and glow that I love. The foundation is light and buildable too. One thing to note though, is that this foundation is not suitable for those who have oily skin as this has the potential of turning into an oil slick by noon. With my combination skin, I do get that oily feel around my nose, but I pat a tissue over the area and the problem is solved. I also totally like that it comes in a pump bottle unlike Studio Fix and the fact that it has an SPF of 15 makes it a winner! 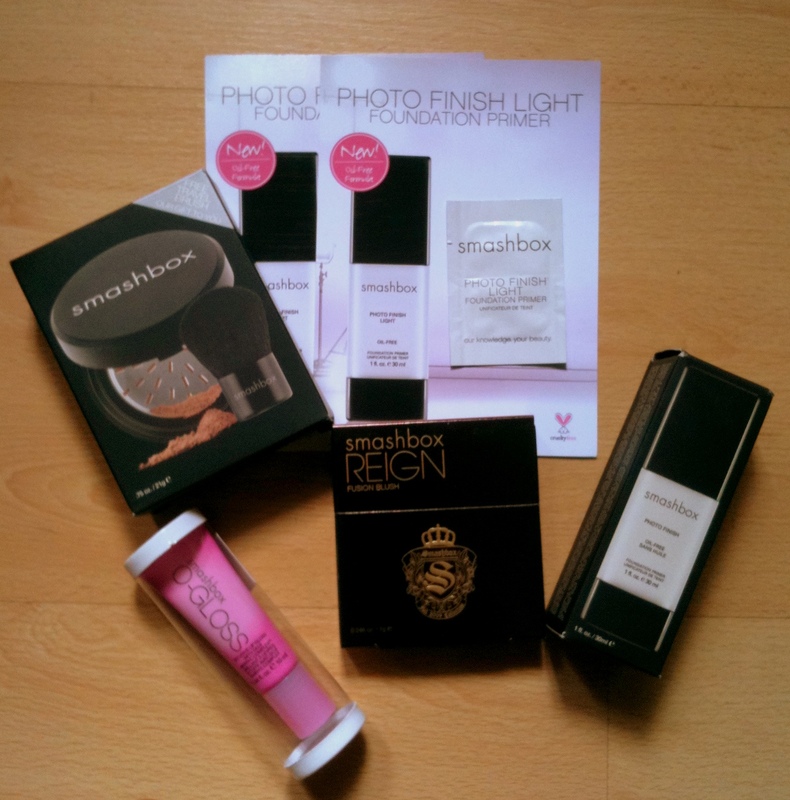 Smashbox Photofinish Primer is Da Bomb! Everyone needs a best friend. This primer has become mine. I must admit that the many reviews online got me lemming this primer for a long time. I was not disappointed and I believe I have joined the thousands or probably millions of women out there who think this is a great product. My first taste of a primer came in the form of Revlon's Beyond Natural Smoothing Primer. This did not work for me because it felt heavy and just sat on my face. It did not do what I expected it to do which is give me a smoother complexion. My skin was also unable to 'breathe' the whole time I had it on and it was just not right for me! 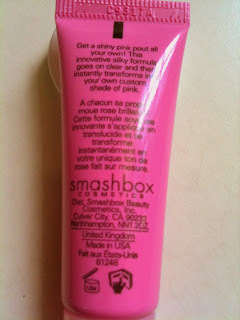 I purchased the oil-free Smashbox primer because of my oily t-zone and with combination skin like mine, an oil-free product is always welcomed into my make-up family with open arms! Start by applying your moisturizer and give it a minute to absorb into your skin. Then take a small amount of the primer....a half pump to start with. Smooth all over the face and you are ready to go on to the next steps of your routine. the primer has done wonders for the area under my eyes with fine lines. Prior to using this primer, my concealer used to settle happily into my lines and create horrible looking creases that made me look old and haggard. With the primer sparingly applied under my eyes, my concealer does not settle with a vengeance into the creases. I still do get some concealer settling in the lines because I tend to sweat easily there but all I need to do is pat the area under my eyes with my finger to smooth out the concealer and it looks as fresh as when I applied it. the product is odorless as opposed to Revlon's primer which has an unpleasant smell. I am so pleased with this purchase and I forsee that it will be eternally part of my make-up arsenal. I love it. Have You Ever Forgotten A Step In Your Makeup Routine? Or does this only happen to me?! I walked out of the house the other day and had the strongest feeling that I had forgotten something. Turns out, I had forgotten to put on mascara. So yeah, I do forget a lot. A little sweet love from my hubby came in the form of this beautiful gift several years ago. I used it so frugally that it lasted me a long while! When I finally got to the bottom of the bottle recently, he surprised me by replacing it with the same fragrance, Petite Cherie, but in a prettier more luxe bottle! 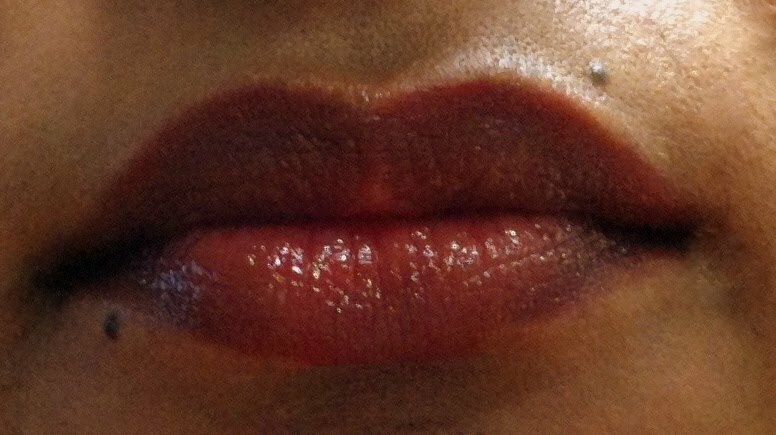 I love some of my lipsticks so much that wearing anything else is such a bother. 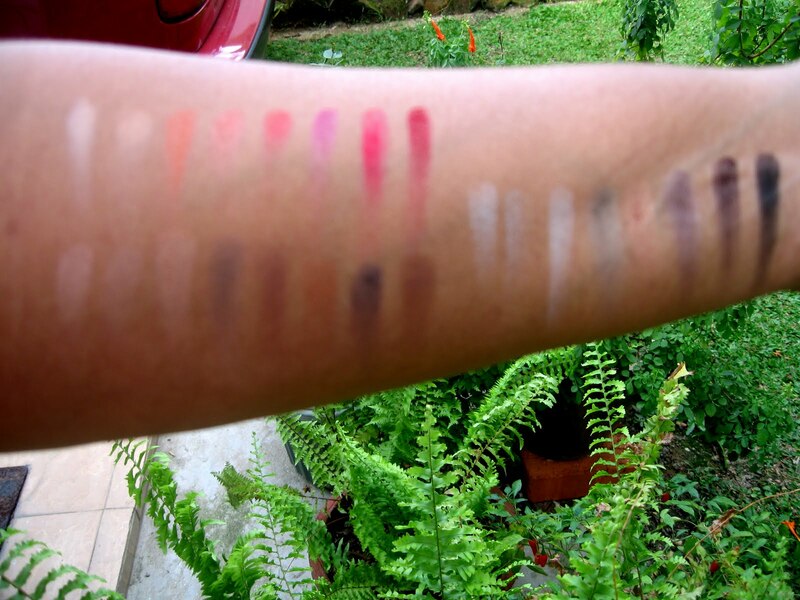 My hands are conditioned to reach for a certain type of lipstick and I do this without thinking every morning. Yes dear readers, I have been in an illicit long term relationship with Revlon's ColorStay Mineral Lipglaze's because of it's amazing moistness and staying power! Yet, this morning I reached for a SilkyGirl. Her name is Illusion. This is an orangey brown color that is creamy. 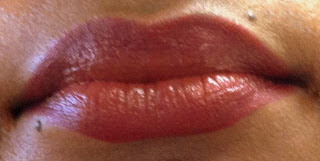 It goes on semi sheer and in order for me to carry it off reasonably well, I have to line my lips with a slightly darker lip liner as you can see below. I put this on at 7.30 this morning and by 9.30am after a cup of coffee, a healthy swig of water and breakfast.....it was all gone and my lips felt dry and naked! I reached for my trusty tube of Revlon at 10.30am. Benefit and the Three Bobbi B's - Which One Is A Hit And Which One Is A Miss? 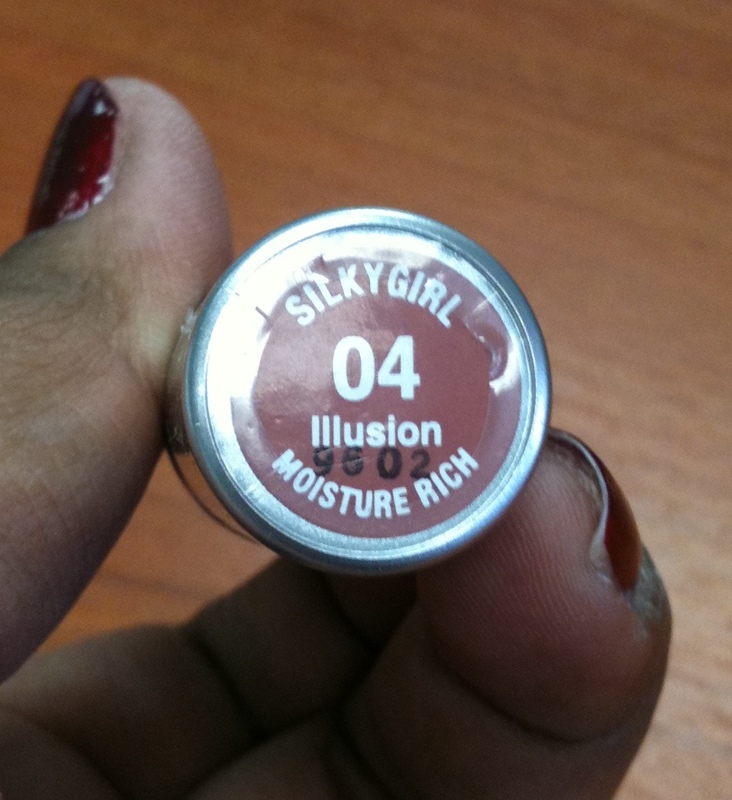 This retro looking number is Benefits Cream Eyeshadow/Eyeliner in a funky color called 'Get Figgy'! 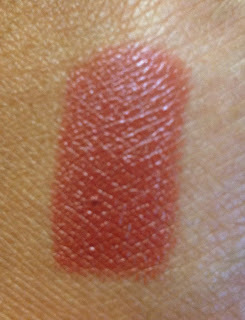 Below is a swatch of it. It looks rather drab and brown in the pot but once applied it is a slightly frosty mauve. 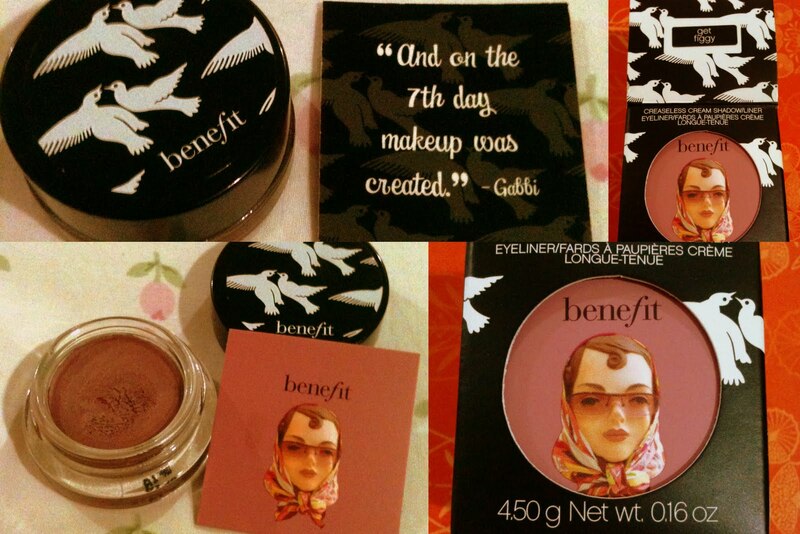 Don't you just love that quote up there "and on the 7th day make up was created"? Its cuteness in a package and I am well on the road to becoming a hoarder because of all these boxes which I refuse to part with. I mean how can you throw that box away - it's so darn cute! I love how it is creamy and smooth and glides on like a dream, does not drag on your skin and is not at all streaky. Bonus - it can also be used as a liner! I love when you get two different ways of using a product for the price of one. 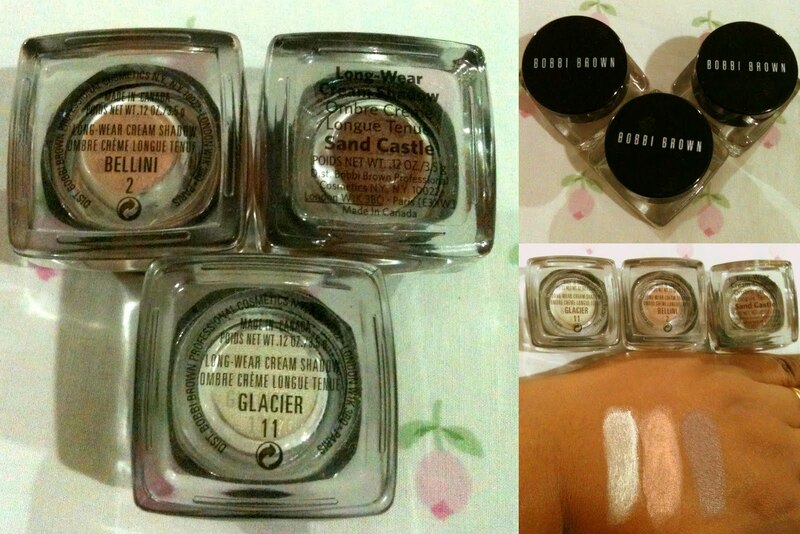 Bobbi Brown's cream shadows, on the other hand, have left me cold....let me explain why. 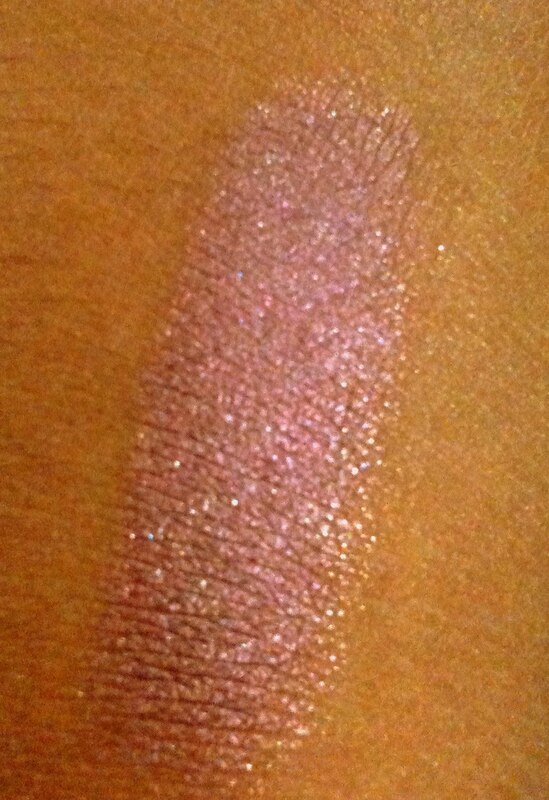 My first taste of cream shadows were courtesy of Bobbi Brown. I purchased this unholy trinity several years back and until this day, they lie in state at the back of my eyeshadow drawer! Have you ever gone shopping on a bad day and come away making purchases that make you go "Hmmmm"? Here are the three B's and they are called (see swatch from left to right) Glacier (Brrr! ); Bellini and Sand Castle. They do not go on super smoothly and (this is TOTALLY my personal opinion) if I try to blend it in too much, turns out streaky and uneven. Or is it just me? 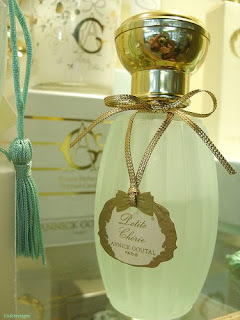 The only color which I like is Bellini and it is great as a base - other colors layered on it looks gorgeous. Sadly, Glacier was pitched to me as a highlight for the browbone and thats the only thing I can see it as now. I have not experimented with it as a whole lid color - I shudder at the thought of all that 'glacial' whiteness on my brown lids! 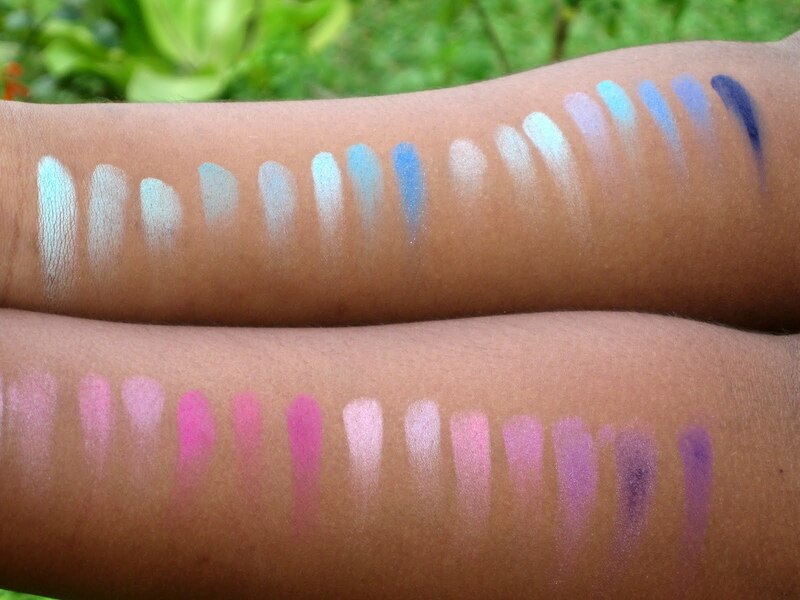 Bottom line is I would go back to Benefit for more of these cream shadows and give Bobbi Browns cream shadows a miss. What caught my attention about this gloss is it's ability to turn from clear to a shade that is natural and complements your lips, all in a few seconds! I HAD to try this. 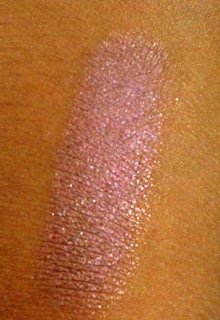 As you can see below, the O-Glow promises to transform your lips to your own custom shade of pink. How cool is that? It looks very natural and it looks like I have a sheer flush of color on. How sweet is that, dear readers? Most of the time for the office I keep everything sheer and light except my lips which takes center stage with a pop of bright color. I am the sort who looks pale and washed out at the end of the day if I do not reapply lipstick after lunch so color is crucial to brightening up my look. Best of all the first time I wore the O-Gloss, my man commented that he loved the look of my lips with sheer color on. That IS a plus in my books! 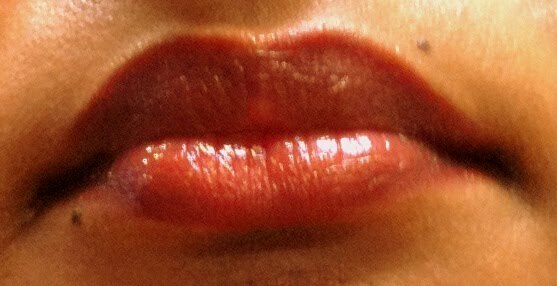 On to what makes the O-Gloss special.......it also contains Goji berry extracts which are full of beneficial properties. In Asia, goji berries are easily available in its dried form. They look like dried currants or raisins only goji berries are red. These berries are very high is antioxidants and is ful of essential minerals and amino acids. Personally, I have often snacked on goji berries because it is known to improve eyesight....so I guess it has been doing other good things for me as well! Mum also throws in a handful of these berries when she stir fries vegetables. It adds some oomph to boring green veggies and is also good for us. Dear readers, the O-Glow costs 86 ringgits and may be rather steep for some beauties but so necessary in achieving that 'natural' look. Its a keeper! Firstly, I was treated to a quick makeover by a charming SA called Yuri and secondly, she took the trouble to explain the products on display to me patiently and let me play around with some of the stuff. My intention was only to purchase the much talked about Primer but when I saw how lovely some of the other products were, I had to get them. Admittedly, I was attracted to the packaging of this powder and the fact that the powder is dispensed by moving it clockwise and 'shaving' the amount that you need. Imagine the face of the powder is a clock and you should be able to picture the face of a clock with the numbers 1 to 12. Twist to 'one o'clock' and you get enough powder for sheer coverage on your face. Twist to 'two o'clock' to get enough powder for medium coverage and so on. It comes with a small kabuki brush to apply the powder. The brush used at the counter was so much softer than the one in the box. I guess over time and perhaps a few washes, my brush will be soft too. Also, and this is not a complaint, the brush did shed a little on my first and second use only. So I am guessing that this is acceptable. 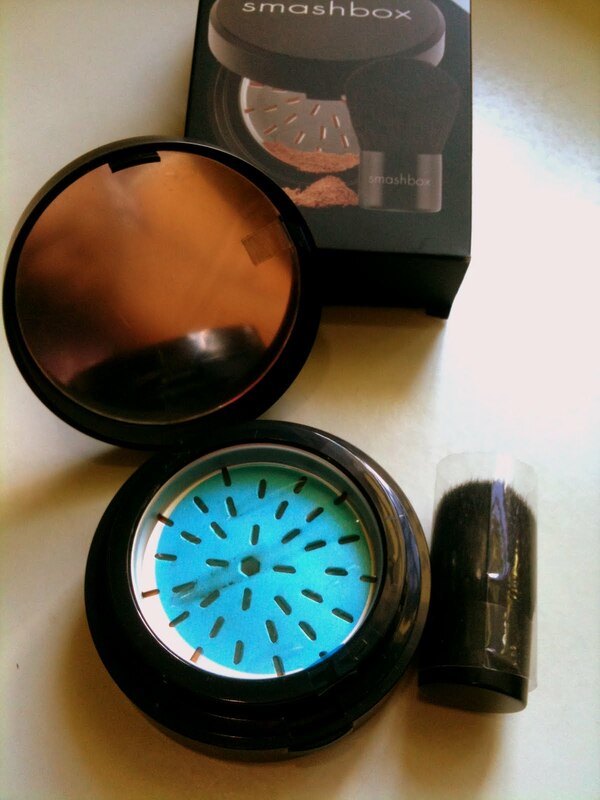 The powder is finely milled and I like the fact that I have the amount I want to use. With other powders that I have used, there are a few holes on a plastic cover that separates you from the powder and when you get to the last bits of the powder, it is such a bother tapping the container upside down over your puff trying to get the stuff out! You know what I mean right? So with this, one twist and you are good to go. It took some time to get used to applying my powder without a puff which I usually pat all over my face. I find it also easier to apply powder around the tricky areas such as the eyes with a puff too. However, Yuri taught me how to apply a sheer layer of powder all over my face with the kabuki brush and to get to the eye area by gently buffing the brush on and around my closed eye. I was also initially a little apprehensive that the brush would 'move' my carefully applied foundation and she assured me that if I waited a minute for my foundation to set, then applying the powder would not move it at all. This powder is special in many ways. Amongst other things, it contains pure gold (! ), 48 minerals and 11 amino acids. It also contains peptides which has anti-aging properties. This powder claims to decrease the appearance of wrinkles around the eyes by 33% after 10 minutes of use. In 6 weeks one should observe an overall decrease in the appearance of fine lines and wrinkles by a whopping 67%! My observation is that the powder gives one a flawless and luminous finish. I do not have many fine lines except around my eyes and these were less pronounced with the use of this powder. So I am very much looking forward to an obvious change in 6 weeks time and will report back on whether this claim is true. I am totally loving this powder and was delighted to note that I found a shade that matched my skintone! There was even a foundation shade that suited me but I declined. Perhaps another day eh, readers! This powder is also oil-free, talc-free and paraben-free which is great news for those with oily or sensitive skin. I absolutely think it was money well spent as I am enjoying these products already. My thoughts were on getting the primer only but I came away with 3 other products and a couple of samples. They are:- Halo Hydrating Perfecting Powder in Medium, Reign Fusion Blush, O-Glow Intuitive Lip Gloss, Photofinish Foundation Primer and samples of Photofinish Foundation Primer in Light. Biotin - A Boon For Those With Hair Loss Problems? A nail blog I chanced upon sparked my interest in a supplement called Biotin - http://getchanailsdid.blogspot.com/2010/02/biotin-users-talk-to-me.html. The blogger asked readers to let her know the effects of biotin on their nails and if it became stronger after taking this supplement. I was really intrigued because of what else I read about Biotin....that it can help stop hair fall too! You see readers, I have suffered from severe hair fall since I discovered that I had an overactive thyroid many years ago. My thyroid function is back to normal but my hair still falls at an alarming rate! Which is why this product so excited me. I did a quick snoop around and found that many people have taken Biotin and found that it helped with their hair loss problems and also gave them stronger and healthier nails. When I looked for this product at our local pharmacies/drugstore, I could not for the life of me find it! You can see biotin in small doses in your multivitamin tablets but in order for it to work its magic, you need to take this in larger doses. 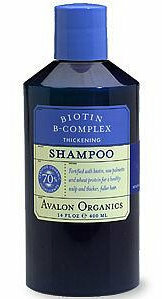 I found a seller on Lowyat.net http://forum.lowyat.net/StuffForTheLadies who specifically sells Biotin as well this other miracle in a bottle which is Biotin fortified shampoo and conditioner by Avalon Organics. I have been using these two for almost two weeks and I am loving what I see. My hair is fuller and softer now and although its too soon to tell, I do believe that my hair will stop falling! What I particularly like about Avalon Organics is its all natural ingredients. In every bottle of this shampoo, you will find the goodness of B vitamins - biotin, niacin and panthenol, saw palmetto and wheat protein, aloe and jojoba- to nourish the hair and scalp for added body and shine, increased scalp circulation and stimulation of hair follicles as well as to control hair loss. It also gives the hair more body and volume. To get the most out of this shampoo, I use very little because it lathers well and apply to my hair and massage into my scalp. I follow with a good rinse and then apply the conditioner which has similar properties too. 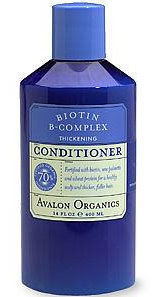 I was initially not too keen on the conditioner because I thought it would weigh down my thin and fine hair but that did not happen at all. Totally loving the benefits of the shampoo and conditioner now and waiting to see what else is in store after taking Biotin pills.....fingers crossed! It is believed by many that cleansing and exfoliating is important in maintaining great skin. Thus I cleanse three times a day - first thing in the morning, as soon as I get back from the office and just before I sleep. This is because of my combination skin which causes the area around my forehead, nose and chin to become oily. I also exfoliate once every week. Following the extremely dusty environment that I was working in these few weeks, I needed to step up my cleansing routine to ensure that my pores were not clogged and thus began exfoliating twice a week. 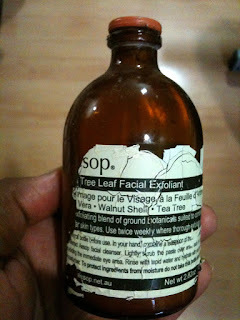 My favourite exfoliant is this one by Aesop - Tea Tree Leaf Facial Exfoliant and I have had it for the longest time as you can see from the tired looking bottle! 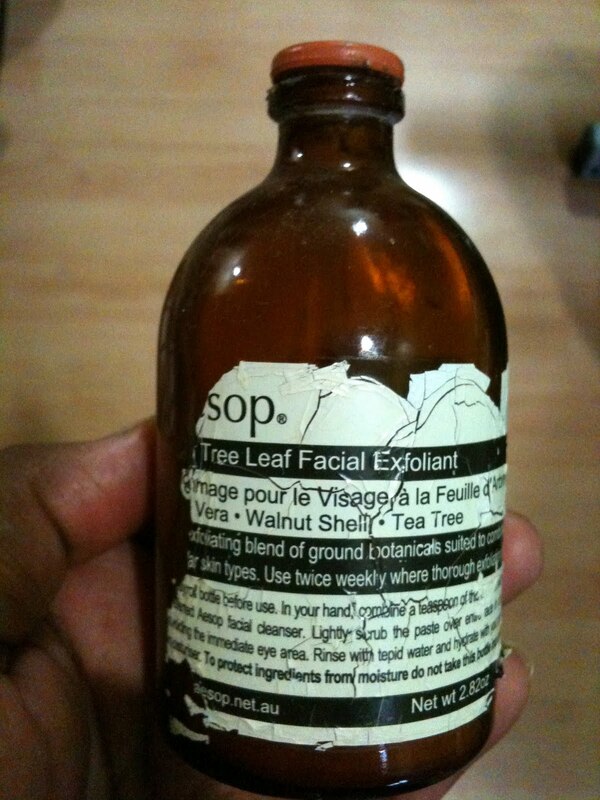 The exfoliant is a mixture of ground tea tree leaf, nuts and purified clay. 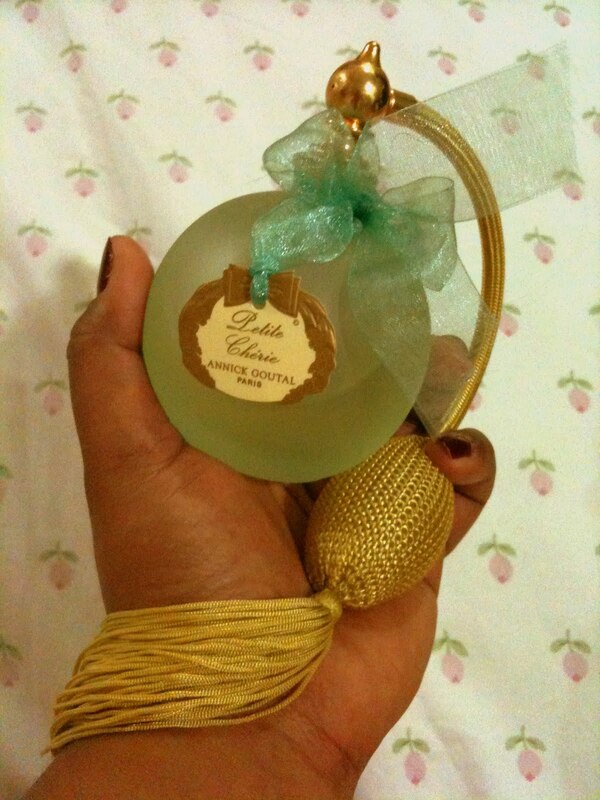 It is suitable for most skin types which is perfect for my combination skin. I just tip some of the powder into the palm of my moistened hand and gently rub over my face and neck. I also use the excess on the back of my hands to give it a gentle scrub as well.....as you know a woman's true age is reflected by how smooth the back of her hand is and I am hell bent on that age being 25 and staying there!! There are many types of exfoliants on the market such as beads which are gentler and grains such as the one I am using which is why the texture is on the coarse side so for those who prefer a gentler scrub, this may not be suitable. Also, gentle massaging helps to zap the impurities that cause dullness and helps to stimulate blood flow which restores the natural luminosity of your skin. So dear readers, how often do you exfoliate?